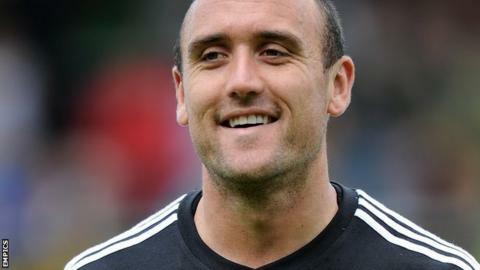 Oldham midfielder Lee Croft says football's anti-racism drive has been damaged by false claims he racially abused a ball boy at Sheffield United. Croft, who apologised to the youngster for swearing, will face no further action from South Yorkshire Police. "There was no accusation whatsoever from the ball boy of racist abuse. It was always from a minority of fans at the Sheffield United end," he said. "It makes the whole kick racism out of football [campaign] take a step back." The 27-year-old added: "The next time this happens are people going to say is this just another false allegation?" Police investigated an incident late in the game at Bramall Lane on 13 October where Croft went to retrieve the ball for a throw-in as his side pressed for their late equaliser in a 1-1 draw. He became angry when the ball was kicked back on to the field beyond him by the ball boy, who has not been named. "He's with Sheffield United and he's trying to let the clock run down and I kind of understand what he's done," Croft told BBC Sport. "In the heat of the moment, I've said things perhaps I shouldn't. I've sworn at the lad, which I regret now and I apologise for. What came after that was beyond a joke. "When the policeman told me there was allegations of racism, I was a bit shocked. It was all a bit surreal. "It's one of the worst things, in my opinion, you could be accused of. I'm just glad it's over and I can put it all behind me. Although I'm happy they did the investigation, it is a waste of police time. I'm glad they have got the truth." Croft, who is on loan from Derby County, said he had suffered threats and abuse since the racism claims were made to police. "I've had a few threats - people saying they hope I break my leg, they'd love to bump into me in the street and see if I'd say it to them," the former Manchester City player said. "People who don't know me think I'm a racist. I couldn't be anything further from that. I can laugh about it now but at the time when you are getting a lot of abuse, and being accused of such a terrible thing, it's not nice. "Fans should police themselves. It was the other team's fans who accused me of this. They've obviously got no obligation towards me. On that day come 3 o'clock, they hate me and hate all my team-mates. "They have got to realise they are doing damage to these causes by coming out with such ridiculous allegations, trying to get me into trouble. "From now on, people are going to be wary. When racism does appear in the game, people are going to doubt that." The player said sorry for his language to the ball boy after the game and has written him a letter of apology. "I'd agree with anyone who thinks there should be big punishments for racism. If someone is found guilty of racism, it's a massive thing and that needs to be kicked out of football," he added. Read more on Lee Croft: Racism allegations against Oldham player "unfounded"